This photo was taken on one of the rare occasions when my mother's side of the family were (almost – my aunt Mary couldn't be there) all together. 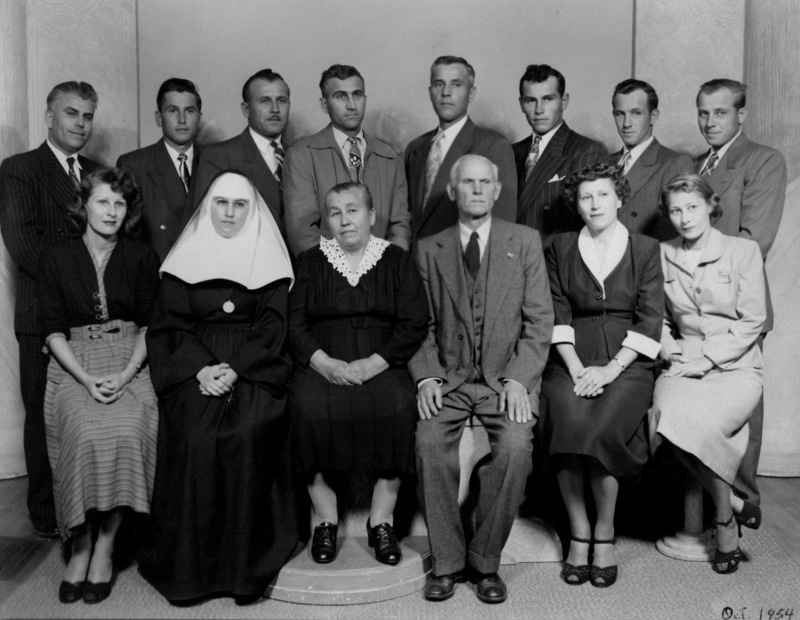 They had gathered in October of 1954 in northern Wisconsin for the funeral of my uncle Pete (the youngest of the siblings) who had died in a car crash earlier that month. My grandparents are, of course, front and center. My grandmother, Hermina, emigrated to the US from Slovakia in 1907 when she was 15 years old; and my grandfather, Steve, in 1905, when he was 20. Neither spoke English when they arrived. Slovak was spoken in the family house all through their lives. My grandmother became quite proficient in English, but my grandfather was never comfortable with it. All the kids started out bi-lingual — Slovak and fluent English. My mother, Margaret (front row, far right), for example, became a court stenographer for the Illinois Appellate Court. My aunt Agnes (Sister Benedict) taught school as a Dominican Sister. There were sons in all the services during the Second World War. My grandparents didn't come to America to see the Grand Canyon, enjoy the Florida sun, or sample Cajun cooking in New Orleans. They came for work and for opportunities to make new lives, for themselves, their children and grandchildren. My family's story is just like those of immigrant Poles, Irish, Chinese, Italians, Swedes, Greeks, Germans (you get the idea). What astounds me is that so many Americans can think that the aspirations of immigrant Mexican, Iraqi, or Syrian families are any different.